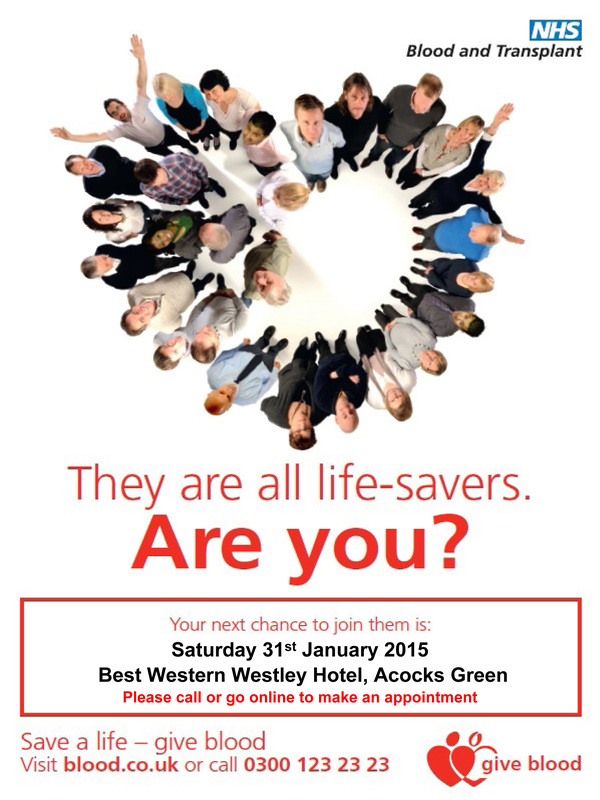 The Neighbourhood Forum have been contacted by the NHS Blood Service with a request for local people to give blood. They will be collecting in Acocks Green at the end of the month (see below). Blood stocks have dropped significantly over the Christmas period and there is a need for them to build stocks back up. All blood types are needed, but particularly O Groups to maintain their life saving supplies. With heavy demand for blood and many people taking extended holidays over this Christmas and New Year period they have seen falling stock levels. Perhaps you can help? They will be at the Westley Hotel between 10am and 2pm on Saturday 31st January. Phone in advance to make an appointment. This entry was posted in Events and tagged Acocks Green, Blood levels, donate, Give Blood, help save lives, Live-saving, NHS, Westley Hotel, Westley Road. Bookmark the permalink.